set on fire by Jewish extremists. A large meeting of solidarity and prayer at Tabgha. 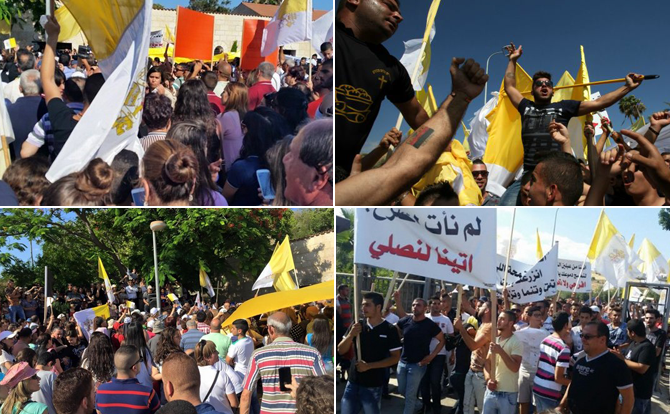 TABGHA – In the wake of the arson perpetrated against the Church of the Multiplication of the Loaves in Tabgha, many testimonials of solidarity flowed in. A large gathering of prayer and unity was held on Sunday 21 June 2015. The news is already sadly known: at the night of the 18th of June, some unknown figures set fire to the Church of the Multiplication of the Loaves and to the adjacent Benedictine Monastery. Thanks to the immediate intervention of Benedictine monks and their volunteers, only the southern part of the atrium was completely destroyed by the flames. This meditated criminal and very serious act, have stirred tremendous emotion within the Christian community of Israel, including all denominations, also among Moslems, Druze and Jews. Over four days after the vandalism, it was an on-going pilgrimage of solidarity, starting with the Latin Patriarchal Vicar, Mgr Giacinto-Boulos Marcuzzo, who on behalf of the Patriarch and the Assembly of Catholic Bishops, was the first to show up on site early Thursday morning. Until Sunday evening, end of the demonstration of young Galileans, thousands called on the Benedictine monks to express their solidarity: families, parishioners, schools, movements, institutions, of all religious ranks. The Benedictines of Tabgha, working in conjunction with the Benedictine Community of the Dormition Abbaye in Jerusalem and the “Deutshe Verein vom Heiligen Lande”, under the aegis of Abbot Gregory Collins, responded with a great sense of hospitality and responsibility. Sunday 21 June 2015 will remain in the memory as a “Sunday of Solidarity”. Almost simultaneously, Christians of Galilee, coming out of Sunday mass, met altogether in Tabgha, sharing a moment of prayer and worship, but also a moment of demonstration and protest. Towards noontime hundreds of faithful from the area of Nazareth, Jaffa of Nazareth, Shefaamer and Rameh, accompanied by their parish priests, met at the Church of the Multiplication of the Loaves. Under the leadership of Mgr Michel Sabbah, Patriarch Emeritus of Jerusalem for the Latins, and in the presence of Mgr Giacinto-Boulos Marcuzzo and Fr Amjad Sabbara, ofm, a Liturgy of the Word combined with prayers, readings and hymns was held in the place. Patriarch Sabbah gave a vibrant homily about peace, saying that it is “the specific mission of the Church in this country and in this time”, talking also about “the role of Christians in the Holy Land who should love their land, their Holy Places, and remain steadfast where the Lord has called us to live and give witness”. The faithful felt relieved and encouraged after these appeals to peace and hope by the Patriarch which helped them to deepen their thoughts and reach to Christian conclusions regarding the situation. During the celebration a group of priests and faithful from the Orthodox Church came also from Kafr Yassif, Sakhnin, Abu Snan and Makr-Jdeideh to join the prayers. 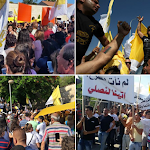 In the afternoon, thousands of youngsters from all over Galilee gathered themselves in front of the Church of the Multiplication holding banners, messages and religious symbols. The demonstration, more or less spontaneous, included some local political figures. Together with short speeches, the leading figures of the sit-in focused on their attachment to the Holy Land, the responsibility of the authorities to protect the Holy Places, the right of Christians to live in security like all other citizens and the necessity for a strong peaceful coexistence among all groups in Israel. Others, mainly Scouts, expressed their readiness to work with the Benedictines – Abbot Collins, Fr. Basilius, Fr. 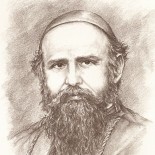 Jonas, Fr. Mathia and others, to restore the damaged parts. The demonstration ended without any incident by a Byzantine Vespers Prayer presided by Father Fawzi Khoury. These crazy acts of vandalism, of blind fanaticism and provocative intolerance are becoming increasingly frequent in Israel over the last years. Mr. Wadie Abu Nassar, media spokesman for the Assembly of Catholic Ordinaries of the Holy Land, distributed a list of tens of actions which are still unpunished. 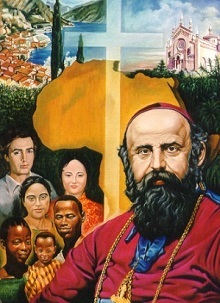 Nevertheless, according to Mgr Marcuzzo, “This time the impact was felt by all inhabitants, especially on the popular level. Walking along the streets of Haifa, or waiting for green light at road junctions, Moslems or Jews would tell us: “Father, we regret what happened in Tabgha, you have our full solidarity”. It is the second time that Tabgha is a subject to vandalism. On the 27th of April 2014, places called Salmanuta and Solitudo were vandalized, while bishops received letters of threat. “Let us hope that the authorities – political, judicial and security forces – will work together seriously in order to put an end to this unbearable intolerance”, Mgr Marcuzzo concluded. Photos : E.T. and A.K. Questa voce è stata pubblicata il 29/06/2015 da MJ in Church and religion, ENGLISH con tag Jewish extremists, Persecution of Christians, Tabgha.